"I'm delighted to confirm my participation in Vina del Mar in Chile," Nadal said on his Facebook page.. "I would like to thank the organization for the invitation to play there and say I've got a lot of fans in the country and finally I'll be able to go there to see them and play my first tournament after the injury that got me out of the circuit for so long. Thank you and see you in Vina." Earlier last week, ATP had announced that Former world number one Rafael Nadal will make his comeback from injury at next month's Brazil Open 2013 from 11 February. Seven-time French Open champion Nadal, 26, has suffered from tendinitis in his knee since losing to Lukas Rosol in the second round of Wimbledon in June 2012. He was forced to miss the Qatar ExxonMobil Open and Australian Open this month due to a stomach virus. Nadal also missed the London 2012 Olympics and the US Open with his knee complaint. The Spaniard has slipped to four in the world rankings during his absence from the Tour. Britain's Andy Murray won the US Open in September and has moved up to number three. 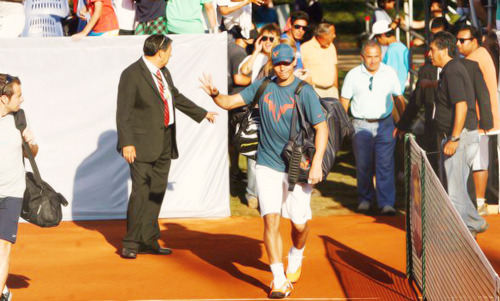 Nadal's appearance in the indoor tournament in Sao Paulo will be his first on the tour in South America since 2005. In 2005, Rafa had won the Brazil Open. PS: It remains to be seen if Rafa Nadal will be fit for playing in back to back tournaments in Chile and then in Brazil, some rumors are suggesting that he might just review Brazil Open after Chile. Here's hoping, he plays both and regains his 100% fitness as soon as possible. Well, I reckon he will play both or at least, I hope, he will be 100% fit to play both. Yes, I too feel that at this point of time, he surely is playing both and also, Uncle Toni hinted, it will be a great test for Rafa's fitness to play in these back to back tournaments. Thou, its 100% sure that Rafa Nadal won't be playing in Rotterdam Open 2013 and Dubai Open 2013, but, I am fairly confident, Rafa will be playing at Indian Wells and Miami, 2013. Vamos!! 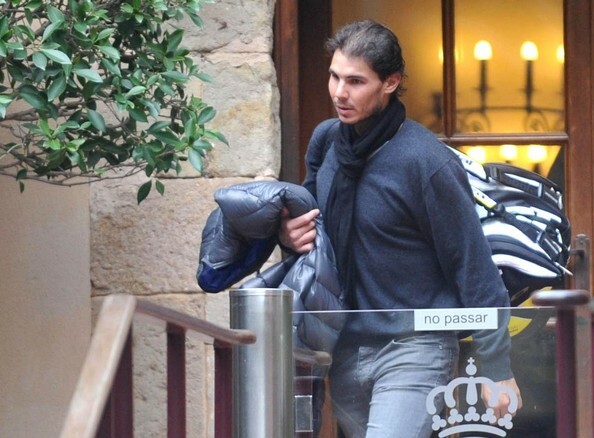 Here is pics of Nadal leaves his hotel in Barcelona and heads out for a day of training..
Rafa Nadal will play his first match in almost 8 months in Vina del Mar on 6 February at 6pm CLST or 9 pm GMT . Good luck to him. 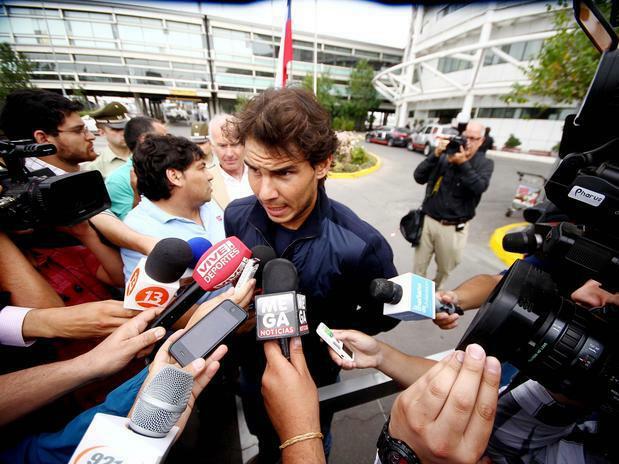 Rafael Nadal to Spanish journalists: "The first few weeks will be very difficult". "Well, I'm going to play after a long time a tennis tournament, professional Tennis Tournament, after seven months", Nadal said "Motivation and desire are big, i am pleased to return to competition, but have to remember that i'd have to be very patient and see how the knee would respond after a long time...The most important for me is the state of the knee. First of all, i want to forget the pain and then to know if i can play three tournaments in a row!!." Nadal continued on to say:"I know that the first three tournaments will be difficult in terms of results, but i'm going to try everything... I need a few weeks to see how things are getting better. " 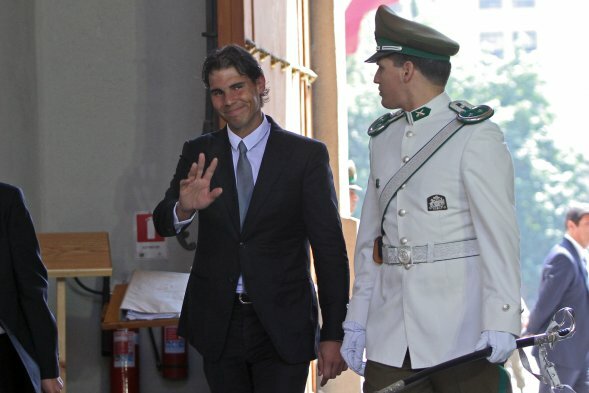 Rafael Nadal speaks to the media after meeting with Chile's President.. This is another proof of how important the sport of Tennis is. 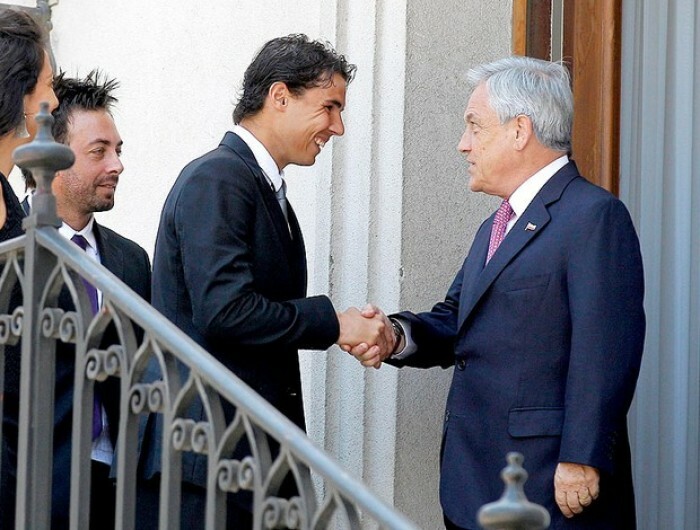 Argentine Prez had met Roger. Glad to see him smiling. Hope he's ready and I wish him nothing but the best and that he stays fit and healthy! Rafael Nadal and Juan Monaco will face the second-seeded doubles team of Frantisek Cermak and Lukas Dlouhy in the first round on Tuesday on Court Central, not before 6 p.m. local time, 9 p.m. GMT, 10 p.m. CET, 4 p.m. EST. 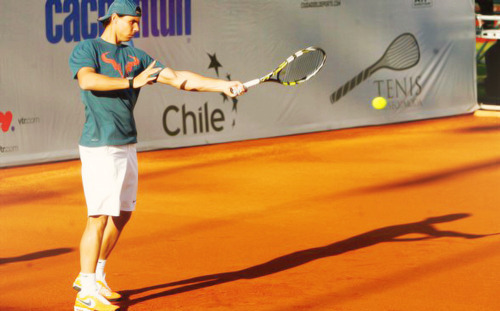 Nadal wins doubles match on Chilean comeback. "It's a good feeling to be back. 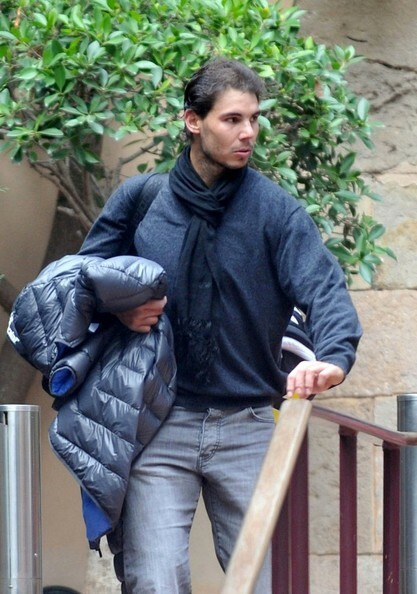 We'll see how the knee reacts," Nadal told a news conference. "The moment and the surfaces were the right ones and playing for the first time in this country was a great opportunity. Nadal receives a commemorative plate as illustrious visitor from the city mayor Virginia Reginato, and 5,000 spectators were in the stadium stood and cheered to him for several minutes. Rafal nadal is a world class player. I like to watch all his matches. I like the way he plays. I am sure there must be special power that goes him going. Hello, If u need to advertise your tennis racket company or store, drop an email to our advertising unit. Please don't put such links in posts.